My last article of 2015 should be special, right? Only those of you who have at one time or another had to write an article every single week can relate to my dilemma. It is an absolute joy and privilege to write these short articles each week but I have to tell you sometime the "inspiration" for the main topics is more on the perspiration side than the inspired side! Especially when due to holidays, the article is due sooner than later! The company that does the majority of the work on this weekly update will be taking some time off so, though the update will still be delivered to your inbox each Monday morning, it will not have an individual CASE article for Dec. 28 and Jan. 4. So the next time you will see my byline will be Jan. 11! 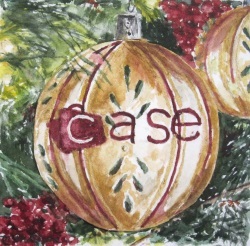 In reflecting on what to write in this last article, I can’t help but think of all the work so many people have put in over this past year to make this a banner year of collaboration for CASE! We started 2015 with an amazing Hybrid conference that was done in conjunction or really parallel to the AZ CEC/CASE meeting in the wonderful Phoenix, Arizona. We had a record number of virtual sites and had sites that really got behind the "team" effort and participated through Twitter, Facebook and text messages! The CASE activities at the CEC convention in April in San Diego were absolutely amazing! The annual combined membership meeting and Board of Directors was well attended with over 90 people from 33 States and 2 countries! The CASE Night at the San Diego Zoo was absolutely the best one ever — imagine dinner for 200 under the stars in one of the most amazing zoos in the world! Our spotlight session on legal issues always is a hit but we had over 400 people attending that session and as always, Julie Weatherly, Esq was both informative and entertaining! July brought the very historic combining of CEC and CASE for our first joint Education Legislative Summit with over 150 well-prepared people from 36 states storming the Hill on Tuesday, July 14! Talk about an impact, we made one. Then in another collaborative effort, CASE backed up to the Georgia CASE (GCASE) fall conference in Atlanta, Georgia, this past October. In staying with this collaborative theme, I just ended a visit in D.C. where I worked with the CEC staff in planning our 2nd joint conference scheduled for July 10-13. While in D.C., I also worked with Dr. Bill East, Executive Director of the National Association of State Directors of Special Education on planning for our first ever joint fall conference! Be sure to put both of these dates on your calendar as they will definitely be worth the effort to attend! And it was quite a week with the President finally being able to sign ESSA into law. We will all be watching very carefully on how this bill will impact Special education, specifically. And of course, though we do not anticipate it happening anytime soon, CASE has been working on the IDEA Reauthorization. We also had a banner year with all our collaborative efforts with our vendor partners! Their ads on this site, our website, their involvement in our conferences and events truly help CASE be the premier organization we are. Please support our vendor/sponsors! 2015 has been a very busy year! I would be remiss if I didn't also say it has been a sad year for the Special Education community and CASE specifically in the sudden death of Dr. Michel Miller ONeal, the CASE Journal of Special Education Leadership. If you missed the tribute I did on Michel, I encourage you to read it. Michel had an amazing impact on the field, on many students and almost everyone who knew her! Her death is a reminder to us all that we need to do the best we can every day as we are not promised tomorrow. Don't let the year end without making your Hybrid CASE Conference plans... Don't put off tomorrow what you can do today! You will be so busy "catching up" after the holidays, why not go ahead now and register for the Hybrid! If you are going to be a virtual site, we will send you a "to do" packet. Turn the logistics over to one of your "up and coming" administrators to give them some practice in project development! The hybrid is a great opportunity to bring a team of educators, parents and community leaders together to learn more on one or both of the topics at our 5th annual CASE Hybrid conference. As a virtual site, you can invite different people for the different sessions and you can have quality discussion/planning time to make this professional development opportunity even more applicable to your district! Registration is up and running for the 5th annual Hybrid Conference to be held Feb. 11-12! Dr. George Batsche will be leading the Thursday session: Actualizing the Practice: Identification of Students with SLD within an RtI/MTSS Framework — Accurate Eligibility and Effective Instructional Practices. Dr. Batsche will be stressing the need for multiple team members from across varying roles so be sure to sign up for a Virtual site and bring lots of cross stakeholders to the Thursday session! Julie Weatherly, Esq. will be doing Legal Issues: Actualizing the Promise on Friday. Where could you get a full day of legal updates for your team — as many as you can get in as big of a room as you can find for the price of just one registration? This day is one you will definitely want your general education administrators to be present for and since you can do this virtually, you don't have to "send" them out of district! A good portion of her presentation will be on discipline so be sure to start planning now for all those Assistant Principals to be attending on that Friday! The Virtual option of our Hybrid is perfect for truly effecting sustainable change on a shoe string budget. Your team can get the same training from national experts without spending the travel dollars and the out of district travel time! We have listened to your assessment of the virtual portion and we will be building in some Think-Pair-Share time and other activities to help your team maximize the time spent together! Start building the excitement for this mid-winter professional development event. When you register as a Virtual site, we will send you customizable flyers and additional hints for getting the most out of your site! The HINTS for the virtual sites are provided for your assistance in planning but when you register, we will also be sending you a WORD document that you can customize for your own flyer! Of course we would also love to have you attend onsite at the lovely Beau Rivage hotel right on the water in Biloxi, Mississippi, at just $109/night! Go to the CASE website for more information and to register for either the Virtual or the onsite! Speaking of keeping up with what is going on... One of my goals in this update is to keep you connected and help you find great information with minimal effort. I have mentioned EduTalk Radio before but I want to remind you of it again. I do an interview on this show about once a quarter and always have a great time with the host, Larry Jacobs. My most recent interview was on Tuesday, Dec 15. You can also find the archive of that session by going to the website. But more than my interview, you can also see all the other interesting topics, speakers and sessions. You can listen whenever you wish and stay caught up with what is going on in all areas of education. So, check them out, real soon! The poll for this week is probably a bit incomplete due to the timing of this deadline... The poll for Dec. 14 asked a question that you might have thought wasn't very related to education much less special education. The question was when was the last time you rode a train, other than a Mass Transit train. I was in the Baltimore, Maryland, area two weeks ago exploring starting a CASE affiliate in Maryland and then had meetings in D.C. So I took the train from Baltimore Penn station to Alexandria. I remember well riding a train from Atlanta, Georgia, to Greenville, South Carolina, every summer from the time I was 5-years-old until I was 14-years-old. It is really hard to believe now, but my mother put me on that train all by myself, even at 5-years-old. My uncles worked for the railroad and I guess they convinced her they would be able to have folks looking out for me. I have only fond memories of those trips. I mostly remember how "grown up" I felt. And mainly because there were adults who believed I would be alright and I could do it. Sometimes in special education we are accused of promoting helplessness for not "pushing" our students to stretch to meet their potential. But what we have learned over the years is we professionals often created the glass ceilings that students with disabilities, when given the chance, went crashing through time and time again! We need to instill confidence in our students by being confident in them ourselves! That short train ride from Baltimore to Alexandria gave me time to think and observe. It reminded me what a great way to travel the train can be. So, if you haven't ridden a train lately, think about a train trip for your next get-away! Even though I have almost a million miles with Delta, I am already planning my next train trip! I would love to hear your ideas on trains on our Facebook page! The number one response at 38% of those answering the poll was "I have never ridden a train." Coming in at a close 2nd at 31 percent was "haven't ridden a train in 5 years." 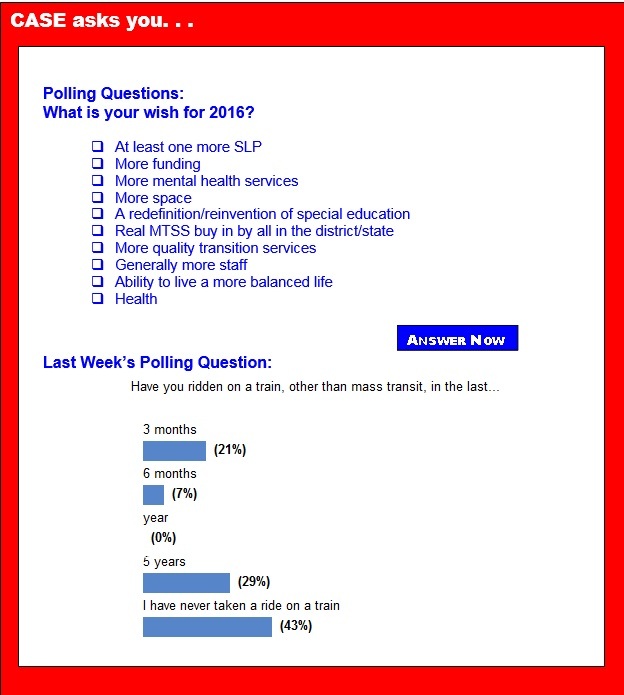 Third place at 23 percent was having "ridden the train in the last 3 months." And pulling in at last place at 8 percent was having "ridden the train in the last 6 months." I don't know how special this article was, but I had fun thinking back over the year. Robin and I wish you a great time with your family, friends, and colleagues as you finish up 2015! We look forward to working with you as you do the most important job in your school district — reminding everyone that All means All! The majority of student misbehavior is successfully addressed through the use of school-wide rules and universal or secondary supports/interventions; however, some students require the use of more concentrated and intensive supports. 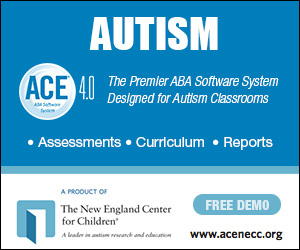 For this population, individual behavior plans and functional assessments can prove beneficial in pinpointing and addressing the unique needs of students. Typically, a team of knowledgeable professionals is responsible for creating behavior plans based on sound behavior theory and data-based decision making. Extensive research has been conducted on individual behavior plans and functional assessment, yielding positive results. However, these results should be interpreted carefully due to the individual nature of each plan and circumstances surrounding student behavior. 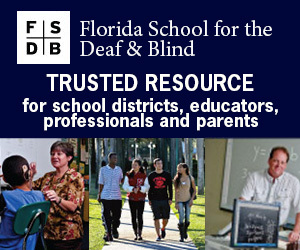 Decades after laws for students with disabilities, what have we learned?